Why Are These Philip Morris International Insiders Buying Millions of Dollars in Stock? Two directors have made big bets on the tobacco giant's stock, and retail investors should consider their likely reasoning. As investing legend Peter Lynch once noted, "Insiders might sell their shares for any number of reasons, but they buy them for only one: They think the price will rise." Obviously, that doesn't always mean they'll be right. Sears Holdings Chairman and CEO Eddie Lampert, for example, has dumped more than a billion dollars into the troubled retailer, and it still looks like the stock is on its way to zero. Still, when insiders sink considerable sums of money into their companies, it's worthwhile to check out what could be motivating them. Case in point: Recently, two directors of Philip Morris International (NYSE:PM) made big purchases of the tobacco giant's stock, spending a combined $7.22 million to acquire 88,750 shares at around $81 a share. Let's take a look at what they might be seeing. Data source: Director SEC filings. While Philip Morris International's share price had been trending lower for some time, its first-quarter earnings report really spooked investors. The company, which makes and distributes brands like Marlboro and L&M outside of the U.S., said net revenue excluding excise taxes rose 8.3% to $6.9 billion in the period, below analysts' consensus forecast of $7.03 billion. Even more disturbing to shareholders may have been the stagnant sales of its heat-not-burn iQOS electronic cigarette in Japan. Shares plunged nearly 20% in intraday trading, wiping out about $26 billion from the company's market cap for its worst single-day performance in over a decade, They've lost an additional 5% since then, and are now down 15% since the day before that earnings report. 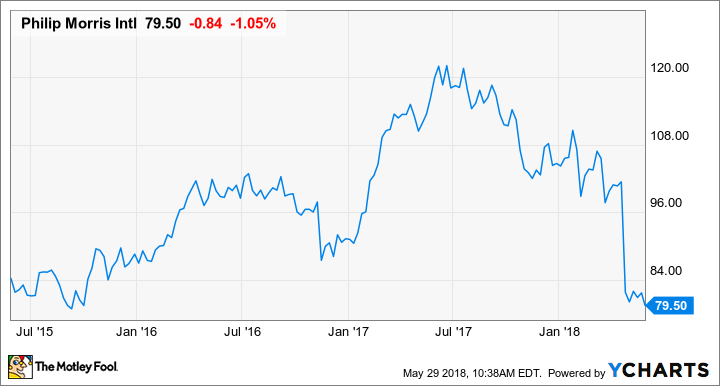 With Philip Morris stock at its lowest levels in three years, insiders may think the time is right to back up the truck and load up on shares. Because of the big bet the tobacco company has made on a "smoke-free future," the decelerating growth rate in the adoption of its iQOS electronic cigarette in Japan is worrisome. After they were introduced there in 2014, the iQOS devices, which are marketed under Altria's (NYSE:MO) Marlboro brand as Heat Sticks, initially enjoyed significant popularity; their unit shipments surpassed those of traditional cigarettes in Q4 2017. The iQOS also became the dominant e-cig on the market with a near-80% market share. The problem is that the iQOS took market share so fast, it outstripped Philip Morris's projections of when it would capture the lion's share of early adopters. Now, ahead of schedule, it finds itself needing to convince older, more conservative smokers -- who represent some 40% of the market -- to switch to a digital product, if the iQOS is going to maintain a strong growth rate. The results in Japan call into question the projected growth trajectories for e-cigs in other markets, particularly here in the U.S. But Philip Morris is ramping up marketing to convince older smokers to switch. More important to note, even though competing products have been introduced in Japan, only 1% of iQOS users have switched to a rival brand. That gives investors good reason to believe the device will remain a growing part of Philip Morris business. Philip Morris International is awaiting word on whether the FDA will approve the iQOS for sale in the U.S., and if it will be given a reduced-risk label here. With or without the ability to market the iQOS as healthier than standard cigarettes, if the company gets sales approval, it will have a tremendous lead on British American Tobacco (NYSEMKT: BTI), which is still weighing submitting its own U.S. marketing application. The iQOS may not get the healthier alternative label it is seeking, but the FDA has given enough signals that it's willing to allow alternatives to combustible cigarettes that it seems likely it will give the company the green light to at least sell the device. Of course, it will have to compete with other e-cigs already on the market, but current segment leader Juul Labs has come under intense regulatory scrutiny because its innovative device is proving exceptionally popular with teens, who can use the JUUL's resemblance to a thumb drive to keep parents and teachers from recognizing it for the nicotine-delivery system it is. There's no timetable on when the FDA may grant Philip Morris the right to begin marketing the iQOS with Altria, but one can surmise it will be sooner rather than later. As noted, Philip Morris International is trading at levels not seen in years. It goes for just 16 times trailing earnings and only 14 times next year's estimates. While those P/E ratios exceed those of Altria and British American Tobacco, PMI also has more levers available to pull in the short term than do its partner and rival. Japan is complicated, but not a loss by any stretch. Moreover, the chance to introduce the iQOS into the U.S. -- the largest e-cig market in the world, ahead of the U.K. and China -- gives it a long runway for growth, even if it quickly brings in the early adopters into its fold. Considering the potential gains ahead for their company, I'd say that these two directors have invested wisely.